. Aerial evacuation of wounded American soldiers from North Africa began in 1943 and expanded to all fronts during the course of the war. The nurses who accompanied these medical flights were known as Flight Nurses. .
. 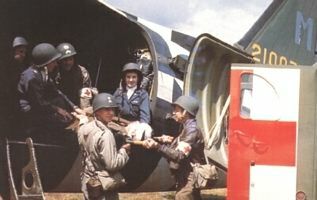 They received special training, such as learning the effects of high flight altitude on different types of patients, responding to aircraft emergencies and post-crash survival in oceanic, desert, jungle or polar environments.Flight Nurses were also exposed to additional dangers apart from the hazards of routine flying, because the aircraft used for aerial medical evacuations also served as transport carriers and thus carried no Red Cross markings to protect them from hostile fire. Each medical flight usually included a medic and a nurse, and could handle up to 25 patients. 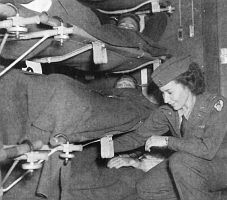 During the war, 500 flight nurses served within the 31 American aerial evacuation transportation units throughout the world. Loss rates were lowered by the fast air evacuations, and of 1,176,048 patients only 46 died during these flights. In a tribute to their bravery, 17 flight nurses were killed in the war.